Men are stereotypically called “meat and puh-tay-tuhs” types. Or at least that is what we call it back home. I would have to agree that such a hearty combination is still a man’s meal on a college campus. Most meals using this simple formula are well received by more than just men, I would argue. I loved the salty, spicy taste contrasted with the creaminess of cheese and sour cream. I am slightly tempted to call this “Baked Potato with The Works, featuring Eggs”. The descriptive title is spot on, but admittedly it does not roll off the tongue well. 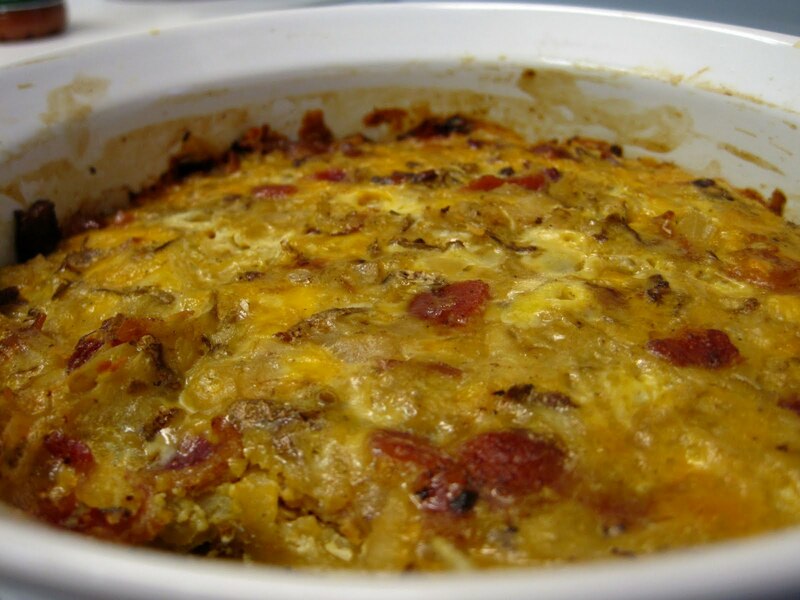 A traditional winning breakfast combo: eggs, hash browns, bacon, cheese, with a twist. It’s made like a casserole. You might be skeptical, as you tend to like everything separate and dedicated to its specific place on the plate. This versatile dish will become a repeat guest in your kitchen for breakfast, lunch, or dinner – sure to please at all occasions. The potatoes, slightly undercooked, coupled with the crispy bacon crunched in your mouth and cheesy egg mixture gave it the fluff factor. 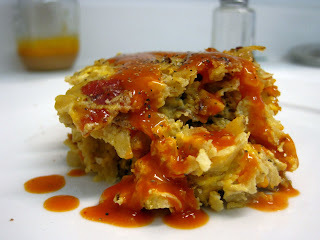 You can leave out the hot sauce if you have tender taste buds, but the type I used greatly added to the full body flavor. At the table, I drizzled a bit of hot sauce, scooped a dollop of sour cream on top and sprinkled playfully with salt and pepper. Although you might be starting to lament the waning days of summer, you can still enjoy this heated hash. 2. 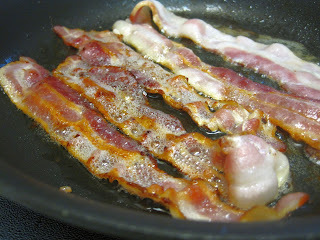 In a skillet, fry bacon strips. Remove and crumble. Reserve about 1 T of the bacon grease for cooking onions. 3. Add chopped onions to hot bacon grease, cook until translucent – about 3 min. 4. 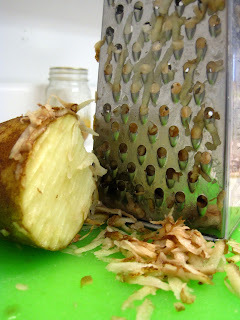 With a cheese grater, shred the potato and cheese [if needed]. 5. Beat eggs, hot sauce and salt and pepper. Add in cheese. 6. In a medium sized Corning Ware dish blend potato and egg mixture. Fold in crumbled bacon. 7. Bake in oven for about 45 min – 1 hr. 8. Add more hot sauce to your liking! Hungry college student by day. Satisfied cook by dinner. Being in college means there is little time between class, work, and life. Because I value the quality of my eating experience, I have learned to balance, budget, and bargain. Using these skills I never go hungry -- and neither will you. First, preheat oven to one semester off the meal plan. Next, in a large bowl, mix together: eating on a budget, time constraints and limited ingredients and utensils. Add a pinch of what’s on sale or in-season and a dash of themed menus for holidays, events and dates. Be sure to use a spatula to get all the lessons learned along the way off the sides of the bowl. Pour into cake pan, and bake for a creative insight on the adventures of cooking and eating.